As the eighties dawned and videogaming burgeoned with possibilities, a veritable army of fixed shooters were gathering in the arcades and, rather fittingly as it turns out, readying an invasion on to home computers, where eager gamers awaited the big names with open arms. But it wasn’t all about the coin-ops, as many others besides sensed an opportunity to capitalise on the rapidly growing domestic market, and the simple but often devilishly addictive Space Invaders template. Alien Destroyer symbolises an uncomplicated childhood nostalgia; of bite-sized sessions, instant gameplay and hi-score plundering hijinks. Taken in a broader context, this game that devoured a not-inconsiderable sum of my formative years was in reality a slightly rickety Space Invaders clone with shades of Galaga, but whilst it lacked the finery of these two lynchpins, its heart was nevertheless in the right place. Kuma Computers’ straightforward effort had its perks, namely that it took less time than nearly any other Spectrum tape to load. This pleasant immediacy was reflected in its simplistic gameplay and no-frills nature. Five rows of alien ships, identifiable by their different colours and designs, travel horizontally back and forth across the screen with increasing rapidity. The rows don’t descend however, neither do they blanket you with a steady stream of fire. Alien Destroyer’s spin on the theme sees individual ships breaking ranks and dive-bombing the player, with each row harbouring ships with differing speed, firepower and swooping tactics. And this works pretty well on the whole. Certainly for Spectrum owners, it was something a little different, even if the marauders lack the fluency and artistry of Galaga’s deadly dancing formations. Even by its genre’s fairly regimented standards however, Alien Destroyer lacks variety, and the challenge chiefly becomes one of concentration. Speed doesn’t alter all that much stage-by-stage; things just become a little more rapid as each wave continues, before seemingly resetting again. There are no fragile shields guarding the player, no power-ups, no UFOs sweeping the top of the screen and no bonus rounds. As such, each level plays very much like the last. What renders Alien Destroyer a pretender rather than a contender are its numerous and sometimes considerable technical troubles. Most notably, it suffers from the most crippling sprite-flicker you’re ever likely ever see, whilst shots sometimes mysteriously miss their target and other times clearly impact (a sensation backed by the appropriate sound effect) but leave the enemy ship intact. Diving enemies, as well as sections of the player’s own ship, incongruously disappear from time to time, whilst the slivers of enemy fire that drain down the screen can sometimes be tricky to track as they change colour depending on which ship assaults you next. More surprising is an erratic frame-rate, which tends to wander between acceptable and treacle-slow. 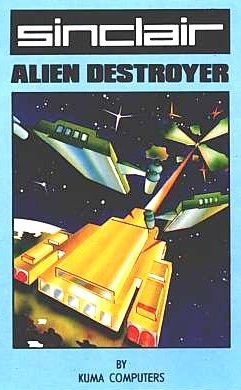 At its slowest, Alien Destroyer leaves you particularly vulnerable to enemy ships flying straight into you as the controls become sluggish, and it’s technically a pretty poor effort, given that Space Raiders (two years its senior) produced a more fluent performance with nearly twice as many sprites on screen. "Er, Captain? Not to alarm you, but the bridge appears to be missing"
And this understandably puts a dampener on the presentation as a whole. AD sports a nice title screen, some distinctive ship designs and a black-space backdrop that fills with multi-coloured specs; an ominous harbinger of the approaching alien legion, and a neat little touch I’d overlooked until recently. The blips ‘n’ pops of the SFX are appropriate though repetitive in the extreme, and you’ll be seeking the sanctuary of the mute button fairly quickly. For all its deficiencies though, it’s often easy to overlook the fundamentals, and Alien Destroyer delivers an acceptable arcade-spirited sci-fi shoot ‘em up in spite of its clunky build. Sedate pacing, as well as relatively gentle enemy firepower means AD offered the opportunity for less-seasoned gamers to gain a foothold, and chasing hi-scores remains a pleasantly addictive pursuit. It's good old-skool fun, though in the scheme of things, there are many similar titles out there that do the whole alien invasion thing to a higher standard.